A multi-axle bus is a bus or coach that has more than the conventional two axles (known as a twin-axle bus), usually three (known as a tri-axle bus), or more rarely, four (known as a quad-axle bus). Extra axles are usually added for legal weight restriction reasons, or to accommodate different vehicle designs such as articulation, or rarely, to implement trailer buses. 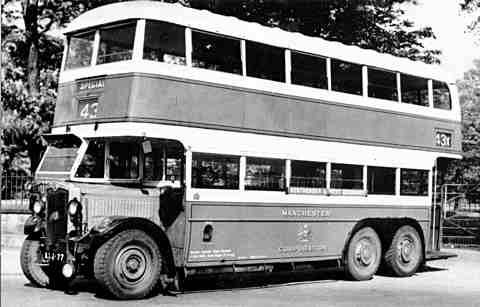 An early example of a multi-axle bus was a one-off three-axle Crossley Condor, shown here, built for the 1932 Scottish Bus Show. Usually vehicle licensing authorities of different countries will set legal limits on the amount of weight that can be put on each axle. In the UK, a recent extension to the legal limit on the length of rigid buses and coaches has led to the increased use of three axles to accommodate the heavier chassis and passenger load. Certain countries apply exceptions to vehicle rules for specific operations. Extra axles may also be provided on shorter buses and coaches to accommodate extra equipment loads, such as passenger lifts, or comforts such as toilets, televisions, climate controls. In addition, in some cases the need is bus cargo transport, when large cargo compartments and heavy weight of cargo needs extra axles. Adding axles to chassis designs is done for specific reasons such as weight or legalities, as having extra axles means extra costs for the operator in terms of tyre replacement, and to an extent, higher fuel consumption. In some buses the rearmost axle is connected to the steering, with the rear most set steering in the opposite direction to the front axle. This steering arrangement makes it possible for the longer triple axle buses to negotiate corners with greater ease than would otherwise be the case. Tri-axle double-decker buses are common in high capacity operating environments where articulated buses are not used, such as Hong Kong and Singapore. Tri-axle buses also see high volume use in Dublin, Ireland. Imported tri-axle buses were used initially by Megabus for high capacity low cost intercity travel in the UK. Tri-axle double decker coaches have been used to accommodate the extra weight. Models are also being introduced on high capacity inter-city routes, such as by the operator Megabus. A twin steer coach is a rare type of tri-axled coach; where the double axles are in the front and steer, as in the Bedford VAL. The Neoplan Megaliner was the first quad axle double decker coach, and is used in Japan. Further examples include the Scania K380IB 8x2. Tri-axle is the standard arrangement of two part articulated buses. Quad-axle arrangement is sometimes employed on articulated buses to accommodate the extra weight of coach bodies, such as in this quad axle articulated coach Volvo Articulated Coach[permanent dead link], and the quad axle double deck articulated coach, the Neoplan Jumbocruiser. Quad-axle arrangement is also the exclusive arrangement for three part bi-articulated buses. A rare reason why a bus may have multiple axles is in the case of a trailer bus, where the bus passenger cabin is built as a body semi-trailer towed by a separate tractor unit. ^ "Crossley Buses - 1918-1939". Malcolm Asquith. Crossley-Motors.org.uk. Retrieved 6 December 2009. This page was last edited on 5 April 2018, at 00:18 (UTC).